Italian gymnast Giorgia Villa and her coach Marco Campodonico had their own competition going on: who was the most nervous. Just minutes before Villa was to perform her floor exercise, her last routine in a nail-biting all-around final competition, she took a deep, cleansing breath and stretched her arms – she was not going to let the little distraction on her earlier beam routine affect her last event. Coach Campodonico paced in circles, at one point turning to an extra application of antiperspirant for a quick reprieve. “Both me and my coach were really nervous today, but I think it was me who had the most nerves,” Villa said. She stepped onto the floor, and 90 seconds later the suffering was over. The 15-year-old laid down a beautiful floor exercise and clinched Italy’s first all-around artistic gymnastics gold after a near flawless competition at the Buenos Aires 2018 Youth Olympic Games. Both coach and athlete could not stop smiling and waving to the crowd. Villa said she struggled with anxiety during the final Friday evening. “Especially on beam I wobbled a bit because of that, but after that I got more relaxed going into the last apparatus, floor exercise. Villa said she did not notice her coach walking in circles before – and even during – her floor routine. Villa, the 2018 junior all-around European champion, won the YOG gold thanks to strong routines on each of the four events, just finishing ahead of Europeans runner-up Amelie Morgan (GBR) and Anastasiia Bachynska (UKR), the first-place qualifier who stumbled on her final event, the floor exercise. The road to the Youth Olympic gold medal was not easy for Villa, who tore her ACL during training in 2017. “I saw all my competitors getting better and I was injured. That was really hard to see. But I kept these goals – the 2018 junior European championships and Youth Olympic Games – in my mind. I knew that I wanted to be there and deliver. With the gold medal, Villa ended Russia’s dominance in the women’s all-around. Russians Viktoriia Komova (2010) and Seda Tutkhalyan (2014) clinched the past two YOG gold medals in the all-around. 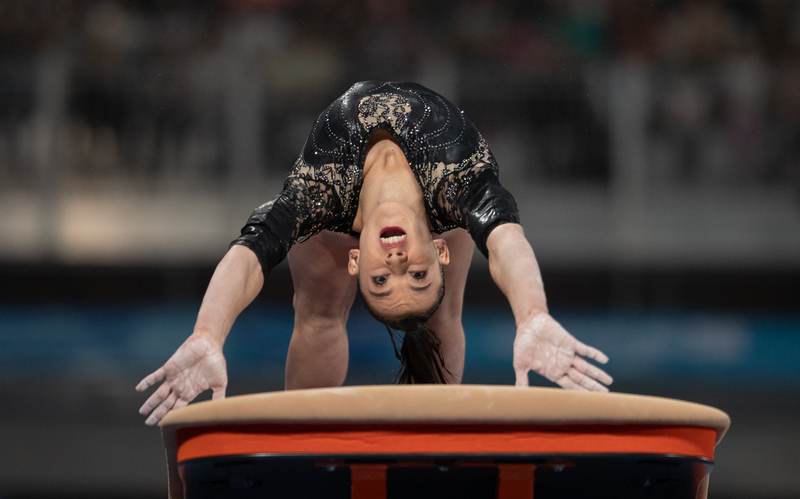 At Buenos Aires 2018, Russian gymnast Kseniia Klimenko failed to reach the podium as she faltered on uneven bars, beam and floor exercise to finish fifth. Chinese gymnast Xijing Tang fell off the beam twice and could not make up for the errors and finished fourth.